I always vaguely assumed that Disney's Mary Poppins was a feminist treatise on the impossibility of marrying career and family life: the practically perfect nanny must politely decline the affections of loyal Bert in order to pursue her vocation, which, ironically enough involves fixing broken families. Because, looking at the magical movie from the viewpoint of an adult, rather than a wide-eyed child high on sugar and dancing penguins, the Bankses are a fairly dysfunctional family, albeit more in the House of Windsor behind-closed-doors style than a Mitchell pub brawl manner. And in this heart-warming film from the House of Mouse, we discover why author PL Travers (real name Helen Goff) felt the need to right the disordered sadness of her childhood through imagination. For twenty years Walt Disney (Tom Hanks at his most charming, genial and twinkly-eyed crazy) has been pursuing the rights to the author's famous creation and she has steadfastly refused. Yet by 1961, on the verge of bankruptcy, she is persuaded by her agent to give Disney a chance. And so, bristling with determination that the legendary movie mogul and his empire of dreams will thoroughly disappoint, she sets off for Tinsel Town. Emma Thompson is (as ever) perfectly perfect as the uptight, brutally forthright, briskly meticulous, tyrannical Travers, all twinsets, pin-curls and endless cups of tea – milk first. 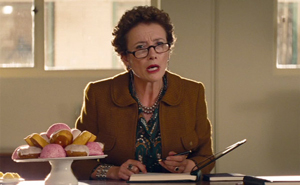 Stay to the end of the credits and you'll hear how exactly she echoes the almost Thatcher-esque tones of the real Travers, who insisted all script meetings were recorded, thus providing much of the rich, comedic material for this film. You literally couldn't make it up. Yet, like Mary Poppins herself, Thompson's Travers is no brittle caricature but a very real woman, whose innate kindness and sympathy has been eroded through years of self-doubt and loneliness but not entirely lost, and who finds herself haunted by the past, and in particular the ghost of her father, the larger-than-life, idolised, yet ill-fated alcoholic Travers (of course) Goff. 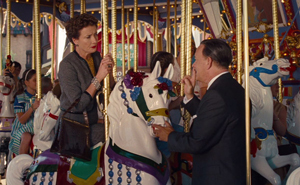 Yes, there's more than a spoonful of glib pop psychology to wash the story down, but that doesn't stop Saving Mr Banks from genuinely touching the heart, Thompson's acerbic presence ensuring it always stays on the right side of schmaltz. In fact, the performances from the entire cast are wonderful: I particularly loved Paul Giamatti's sweet, insightful chauffeur Ralph, who, with his bug eyes and bottle-bottom glasses, could almost be a Disney animation himself. The recreation of 1960s Hollywood and the Magic Kingdom is delightful and the music – well, it's Mary Poppins so of course it's hard to beat. And I defy anyone not to have something in their eye during the uplifting rendition of ‘Let's Go Fly a Kite', a pivotal moment in the movie. 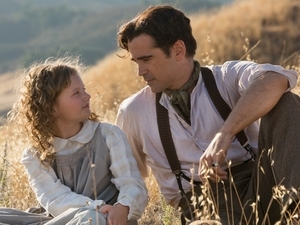 So this Christmas, if you want to laugh, cry and genuinely feel all warm and fuzzy inside (and not just due to an excess of mulled wine), forget reindeer, snowmen and bad Santas and instead just go see Saving Mr Banks.